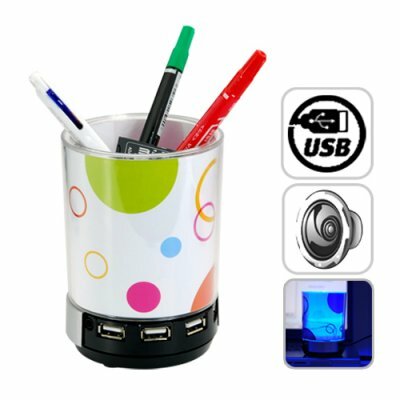 Successfully Added Desk Buddy - USB Hub, Speaker, Pen Holder, Light, Photo Frame to your Shopping Cart. Save valuable desk space with this all-in-one USB hub, speaker, pen and accessories holder, night light, and photo frame. Not only will it free the clutter but it will also illuminate your surroundings! It's the perfect product for the computer hacker that likes to be organized! For roughly the same price as a Big Mac and Fries, we bring you this magnificent invention guaranteed to bring order to the chaotic universe known as your desk! USB Hub: Plug it in and you have access to 4 additional USB ports. Desktop Speaker: Crank it up to full blast and be amazed at the sounds this baby produces! Connects to any 3.5 mm audio source! Pen / Accessories Holder: Great for holding your DVD markers and SD cards. Stuff that gets lose easily! Night Light: Casts a cool purplish-blue glow which is perfect to hack to. Photo Frame: Allows you to customize it with your own picture! This one gadget saves 10 times the space it takes up - no kidding! Use it and you can replace your existing 4 port USB hub, your desktop speakers, your pen holder, your desk lamp, and that framed photo of Captain Picard you keep next to your monitor. Talk about saving SPACE?! What are you waiting for? This unbelievably priced desktop miracle is brought to you by the Internet's #1 Electronic Gadgets wholesaler - Chinavasion. The Desk Buddy's 3.5 mm RCA audio connection makes it ideal for sound output of the following devices: iPods/iPhones, MP3/MP4/MP5/MP6 players, Portable DVD players, Portable game systems like the Nintendo DS / Sony PSP, Laptops, notebooks, netbooks, UMPC, MID, tablets, and smartbooks, as well as cellphones and smart phones. How can you sell something that does so much for so little? It's about innovation and scale. Also we're Chinavasion. We can do magic!